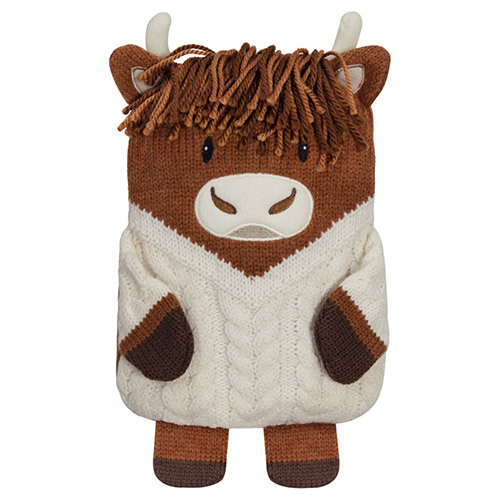 This cuddly knitted Microwaveable Highland Cow Hottie is the perfect way to keep warm and cosy at night, in bed or cuddled up on the sofa. Fragranced with relaxing lavender to help you drift off to sleep. Each microwaveable hottie comes with a removable inner that can be gently heated in the microwave for a long lasting, soothing warmth. A modern day alternative to hot water bottles, each hottie has an easily removable calico insert, filled with tourmaline and lavender seed. When popped in the microwave and gently warmed, the calico insert releases the relaxing scent of lavender to help induce sleep and deep relaxation. Experience the long lasting, soothing warmth for yourself. Remove the microwaveable insert from the knitted cover and heat in a microwave (do not heat the knitted cover). After heating the microwaveable insert, it must be re-inserted into the knitted cover with the velcro securely fastened before use. Place half a cup of water inside the microwave whilst heating to assist rehydration. Be careful when removing the cup of water as it may be very hot. Make sure the turntable is able to rotate freely, is clean and free of grease or anything which could cause burning. Place the microwaveable insert onto a non-metallic plate and place inside microwave oven, making sure the filling inside the insert is evenly distributed (this helps avoid hot spots occurring during heating). In the event of overheating, allow to return to room temperature and inspect all seams and condition of the microwaveable insert. Do not use if damaged. Cover front: 30% lambswool, 70% acrylic. The microwaveable insert contains ceramic tourmaline beads fragranced with lavender. This product is biodegradable and should be disposed of through normal household waste. If the hottie gets damaged whilst hot, allow it to cool to room temperature before you dispose of it. Inspect the microwaveable insert at regular intervals. Discard if found worn or damaged. Only heat the microwaveable insert, do not heat the external knitted cover. Take care when removing from microwave oven as the product may be hot. The heating of the microwaveable insert should only be carried out by an adult. Below are reviews of Aroma Home Microwaveable Highland Cow Hottie by bodykind customers. If you have tried this product we'd love to hear what you think so please leave a review.